Aldred in his book Egyptian Art calls this "a brief moment in the lives of five beings as they are caught in an act of mutual affection". In actuality, the royal palace at Akhetaten had a window from which the royal couple could observe the city and address their subjects. It was said that one day Akhenaten had a vision wherein he saw a sun disc between two mountains. He felt that God was guiding him to make change. 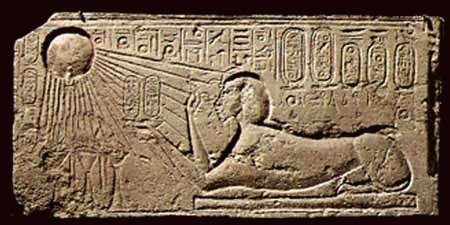 He was shown the God, Aten, as the Sun Disk - the Light. He felt guided by Aten to build a city between the two mountains. In the sixth year of his reign Akhenaten rejected the Gods of Thebes. They were never part of his childhood anyway since he had been shunned as a child. 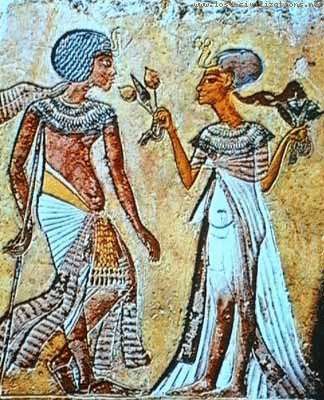 Akhenaten had declared for the first time in recorded that there was only one God - the concept of monotheism. He turned 2,000 years of Egyptian religious upside down overnight! 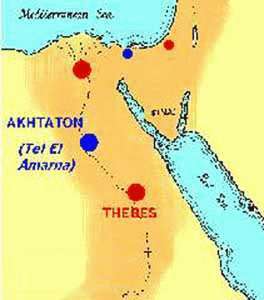 To make a complete break, the king and his queen, left Thebes behind and moved to a new capital in Middle Egypt, 180 miles north of Thebes half way between Memphis and Thebes. It was a virgin site, not previously dedicated to any other god or goddess, and he named it Akhetaten - The Horizon of the Aten. Today the site is known as El-Amarna. In essence he was an cult leader taking his following into the mountains and desert to build a new paradise. Akhenaten established his new religion by building an entire city dedicated to Aten complete with a necropolis and royal tomb. In 1346 BC work began on this new city built in middle Egypt, on a site thought to have been chosen as it was not tainted by the worship of the other gods. In 1344 BC the central section of Akhetaten was completed. Nefertiti's prominent role in Egyptian royal rule and religious worship reflects her influence in the public sphere. During the early years of her royal reign, Nefertiti as part of her religious conversion changed her name. Nefertiti which means "The-beautiful-one -is come" became Neferneferuaten-Nefertiti or "The-Aten-is -radiant-of-radiance [because] the-beautiful-one-is come". A different interpretation of the name change, translated Neferneferuaten to mean--"Perfect One of the Aten's Perfection". Following his wife's lead, Amenhotep IV changed his name in the fifth year of his reign to Akhenaten. In 1342 BC the seat of government was transferred to Akhetaten. 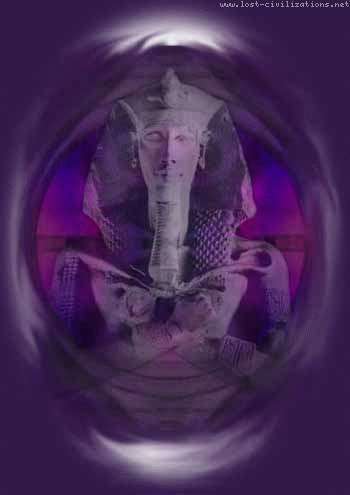 Akhenaten changed thousands of years of art in Egypt. Gone were the images of Amun and the other gods of Egypt, now replaced by Aten, the solar disc. When Akhenaten built his monuments with images of the Pharaoh, he moved away from the traditions of a strong, handsome muscular Pharaoh. Images of Pharaohs with idealized bodies were gone. The Pharaoh was shown as misshapen as was his wife Nefertiti. It became fashionable to show images of the entire royal family with elongated heads, faces, fingers, toes, wide hips, This gave the artists of Amarna new freedom to show scenes of the real life of the Pharaoh, something that had never been done before. The temple was covered with scenes of the Aten, the sun disc with its rays shining down, ending in hands holding ankhs, the hieroglyph for life. The people wondered why the images of the other Gods where not represented. The priests worried about the God Amun and the fact that the 'Rebel Pharaoh' had declared their god extinct and deserted the religious capitol of Egypt. Gone were the royal offerings. 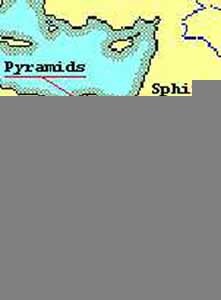 The resources of Egypt were flowing out of the established cities of Egypt and into the desert. People who earned their livings based on the old religions - wood carvers, scarab makers, and others were out of business. The people worried about their afterlife and what would happen now that they were not worshipping the traditional Gods. All of the old belief systems into the next world were discarded. just like what wadup said you need to stay on topic about queen nefertiti if i go on google.com i expect when i type nefertiti and click on a site its going to be ALL about queen nefertiti not her family not her husband not other pharaohs JUST ALL Queen neffertiti thanks i found some stuff. For this site to be any help you need to include a bibliography so for kids doing projects they can cite the information. I thought this was about Nefertiti? You went on and on about Akhenaton! Oh well you have at least 3 good facts! :( Thats a good/bad start!!!! i love this site so much. Samantha Ann Morris loves William Howard Dolak for life!!! . whats up everybody!!! i love bubbles and chupas. when da hew did he die?! im angry.. wah! What are some other good sites on ancient egypt? Preferably something with recipes. what kind of mediums did they used in those days?